Let people in a positive way and by own experience, explore marine life and gain insight into the fact that our surroundings includes a beautiful nature area. Provide understanding of the relationship between all kinds of organisms and elements such as they appear in the sea. Encourage to prevent litter in the sea, on the beach and litter in general. On the beach and along the seashore. A bag to carry found objects (shells, pieces of wood,) extra socks and dry clothing, swimwear and a towel. When the weather is bad: Wellington boots and rainwear. We collect objects along the beach for 2 hours. 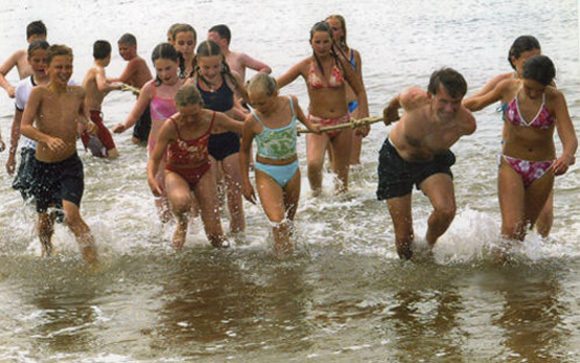 Children and their escorts go beachcombing themselves. After that, we create sea monsters from the found objects. All of a sudden, we find a message in a bottle… The lessons are instructive about marine life as well as the importance of the sea for all mankind. The lessons are suitable for children from 6 to 16 years. We also make use of a large, special trawl net to catch fish and other sea creatures in the water. We then view, describe and explain the catch. These lessons are a lot of fun for children as well for adults. When the weather conditions are exceptionally adverse (i.e. (thunder) storms,) we reserve the right to postpone the lesson. Safety comes first!